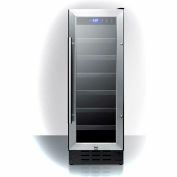 Summit SWC1926 is a full-sized wine cellar designed for optimum wine storage with user-friendly convenience. 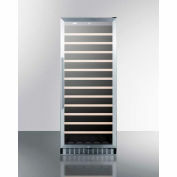 Sized at just under 24" wide and 27" deep, the SWC1926 can store up to 171 standard 750ml Bordeaux bottles on slide-out wooden shelves. The shelves can also be removed to best accommodate larger sized bottles. 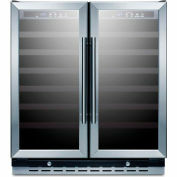 A digital thermostat makes it easy to adjust the temperature between 41°F and 72°F for red or white wine storage, with an LED temperature display that can be shown in Celsius or Fahrenheit. Recessed LED lighting offers an attractive touch. Additional features include a Sabbath mode setting, open door alarm, temperature memory function in case of power loss, and high temperature alarm for added protection. 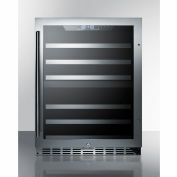 The SWC1926 has a jet black cabinet and reversible stainless steel trimmed glass door that offers a full display of the interior. A sleek stainless steel handle completes the look, and a factory installed lock offers added security. 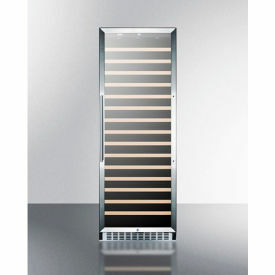 This unit can be used freestanding or built-in with extra rear clearance. See the user manual for more information. With its ideal size and handy features, the SWC1926 is an elegant yet affordable wine cellar for full storage needs. For this unit with a dual zone design, see the SWC1966.